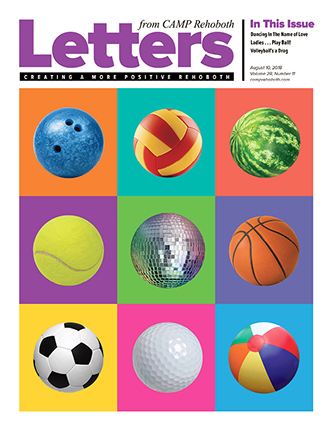 Letters from CAMP Rehoboth relies on the support of readers and members for many of our articles, photographs, poetry, illustrations, and production assistance. Contributing to this issue: Murray Archibald, Sondra N. Arkin, Rich Barnett, Tony Burns, Wesley Combs, Stefani Deoul, Michael Thomas Ford, David Garrett, Michael Gilles, Fay Jacobs, Tricia Massella, Monica Parr, Eric C. Peterson, Mary Beth Ramsey, Richard Rosendall, Terri Schlichenmeyer, James Adams Smith, Eric W. Wahl, Doug Yetter. On the cover: Balls to the Wall, cover design by Mary Beth Ramsey. August 10, 2018 - Volleyball's a Drag: Serve, Block, Spike! August 10, 2018 - CAMP Cheers!